We live in the Quaternary Ice Age, the last million years when large ice sheets covered much of North America and Eurasia, with successive glaciations lasting about 90,000 years interspersed with interglaciations lasting about 10,000 years, such as our preset Holocene interglaciation. Quaternary glaciations were discovered and mapped by glacial geologists from evidence for glacial erosion and deposition on a large scale. Glaciology began as a descriptive branch of geology and has become a quantitative branch of physics. Glaciology and glacial geology are two sides of the same coin. Glaciologists study ice dynamics to model present and past ice sheets. Glacial geologists study the evidence produced by ice dynamics, evidence that controls the models. 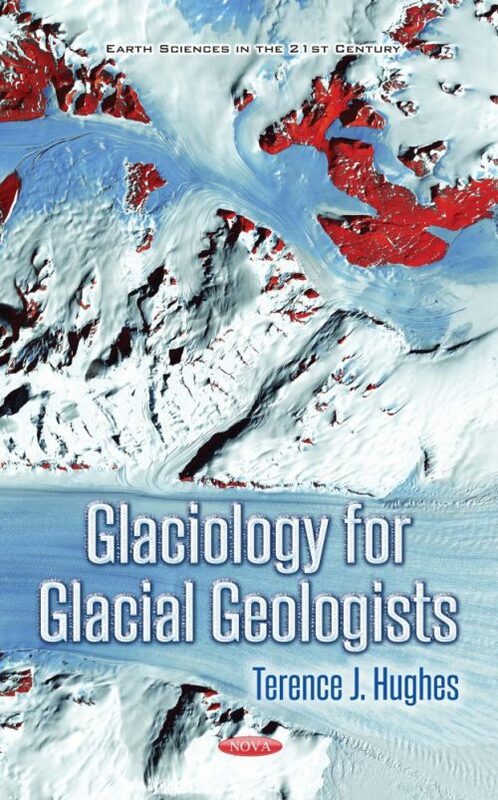 This book is written for glacial geologists that have a modest exposure to mathematics so they can understand the fundamental link between glaciology and glacial geology. This link is the height of an ice sheet above its bed. Ice height depends primarily on the strength of ice-bed coupling. The stronger the coupling, the higher the ice, and therefore the larger the ice sheet. Glacial geology allows an assessment of ice-bed coupling. Coupling weakens under the interior of an ice sheet when a frozen bed thaws and thereby allows ice to slide over the bed to produce glacial geology by erosion and deposition processes. Coupling weakens much more near ice-sheet margins where ice moves as fast currents called ice streams, under which ice-bed coupling vanishes where basal water drowns bedrock bumps or soaks basal sediments. Ackert Jr. R. P., S. Mukhopadhyay, D. Pollard, R. M. DeConto, A. E. Putnam, and H. W. Borns Jr. 2011. West Antarctic Ice Sheet elevations on the Ohio Range: Geologic constraints sand ice sheet modeling prior the last highstand. Earth and Planetary Sci. Lett. 307, 83-93. Ackert, Jr., R. P., D. J. Barclay, H. W. Borns, Jr., P. E. Calkin, M. D. Kurz, J. L. Fastook, and E. J. Steig 1999. Measurements of past ice sheet elevations in interior West Antarctica, Science, 286, 276-280. Alley, R. B., S. Anandakrishnan, C. R. Bentley, N. Lord 1994. A water-piracy hypothesis for the stagnation of Ice Stream C, Antarctica., N. Lord, Ann. Glaciol. 10, 187-194. Andersen, B. G. 1981. Late Weichselian Ice Sheets in Eurasia and Greenland. The Last Great Ice Sheets, Eds. G. H. Denton and T. J. Hughes, Wiley Interscience, New York, 1-65. Andersen, B. G. and H. W. Borns, Jr. 1994. The Ice Age World. Scandinavian University Press, Olso, 208 pages. Anderson, J. B. 1972. The Marine Geology of the Weddell Sea, doctoral dissertation, Florida State University, Tallahassee. Anderson, J. B. (1999), Antarctic Marine Geology, 289 pp., Cambridge University Press, Cambridge, UK. Anderson, J. B., H. Conway, P. J. Bart, A. E. Witus, S. L. Greenwood, R. M. McKay, B. L. Hall, R. P. Ackert, K. Licht, M. Jakobsson, and J. O. Stone 2014. Ross Sea paleo-ice sheet drainage and deglacial history during and since the LGM, Quat. Sci. Rev., 100, 31-54. Astakhov, V. 1998. The last ice sheet of the Kara Sea: Terrestrial constraints on its age. Quaternary International 45/46, 19-28. Batchelor, C. L. and J. A. Dowdeswell 2014. The physiography of High Arctic cross-shelf troughs. Quat. Sci. Rev. 92, 68-96. Barr, I. D., and C. D. Clark, 2012. Late Quaternary glaciations in Far NE Russia; combining moraines, topography and chronology to assess regional and global glaciation synchrony. Quat. Sci. Rev. 53, 72-87. Bentley, C. R. and N. A. Ostenso 1961. Glacial and subglacial topography of West Antarctia. J. Glaciol. 3(29), 882-911. Bentley, C. R. and K. C. Jezek 1981. RISS, RISP, and RIGGS: Post-IGY glaciological investigations of the Ross Icd Shelf in the U.S. programme. J. Roy. Soc. New Zealand 11(4), 355-372. Bernales, J., I. Rogozhina, R. Greve, and M. Thomas 2017. Comparison of hybrid schemes for the combination of shallow approximations in numerical simulations of the Antarctic Ice Sheet. The Cryosphere 111977)2002), 247-265. Birkel, S. 2010. Climate investigations using ice sheet and mass balance models with emphasis on North American glaciation. Doctoral Dissertation, University of Maine. http://digitalcommons.library. Black, R. F. 1954. Permafrost—a review. Geol. Soc. Am. Bull. 65, 839-856. Blake, W., Jr., 1970. Studies of glacial history in Arctic Canada. I. Pumice, radiacarbon dates, and differential postglacial uplift in the eastern Queen Elizabeth Islands. Can. J. Earth Sci. 29, 1958–1980. Blake, W., Jr., 1992. Holocene emergence of Cape Herschel, east-central Ellesmere Island, Arctic Canada: Implications for ice sheet configuration. Can. J. Earth Sci., 29(9), 1958-1980. Bothner, M. H. and E. C. Spiker 1980. Upper Wisconsinan till recovered on the continental shelf southeast of New England. Science 210, 423-425. Boulton, G. S. and C. D. Clark 1990. The Laurentide ie sheet through the last glacial cycle: the topology of drift lineations as a key to the dynamic behavior of former ice sheets. Transactions of the Royal Society of Edinburgh: Earth Sciences 81, 327-347. Boulton, G. S., P. Dongelmans, M. Punkari, and M. Broadgate 2001. Paalaeoglaciology of an ice sheet through a clacial cycle: the Europea ice sheet through the Weichselian. Quat. Sci. Rev. 20, 591-625. Breemer, C. W., P. U. Clark, R. Haggerty 2002. Modeling subglacial hydrology of the late Pleistocene Lake Michigan Lobe, Laurentide Ice Sheet. Geol. Soc. Am. Bulletin 114, 665-674. Brigham-Grette, J., L. M. Gualtieri, O. Y. Glushkova, T. D. Hamilton, D. Mostoller, and A. Kotov 2003. Chlorine-36 and 14C chronology support a limited last glacial maximum across central Chukotka, northeastern Siberia, and no Beringian ice sheet. Quat. Res. 59, 386-398. Brookes, I. A. 2007. First recognition of a Laurentide ice stream Robert Bell on Hudson Strait. Geographie physique et Quaternaire 61(2-3), 127-132. Bromley, G. R., B. L. Hall, J. O. Stone, H. Conway, and C. Todd (2010). Late Cenozoic deposits at Reedy Glacier, Transantarctic Mountains: implications for former thickness of the West Antarctic Ice Sheet, Quat. Sci. Rev., 29, 384-398. Bromwich, D. H., E. R. Toracinta, H. Wei, R. J. Oglesby, J. L. Fastook, and T. J. Hughes 2004. Polar MM5 simulations of the winter climate of the Laurentide Ice Sheet at the LGM. J. Climate. 17, 3145-3433. Budd, W. F., D. Jenssen, and U. Radok 1971. Derived Physical Characteristics of the Antarctic Ice Sheet. Australian National Antarctic Research Expeditions (ANARE) Interim Reports, Series A (IV), Glaciology No. 120. Dept. of Meteorology, University of Melbourne. Budd, W. F., and I. N. Smith 1981. The growth and retreat of ice sheets in response to orbital radiation changes. In Sea Level Ice and Climatic Change, Vol. 131. International Association of Hydrological Sciences, 369-409. Budd, W. F., D. Jenssen, and I. N. Smith 1984. A three-dimensional time-dependent model of the West Antarctic ice sheet. Ann. Glaciol. 5, 29-36. Burton, J. C., L. M. Cathles, W. G. Wilder 2013. The role of cooperative iceberg capsize in ice-shelf disintegration. Ann. Glaciol. 54(63), 84-90. Calov, R., A. Ganopolski, V. Petoukhov, and M. Claussen 2002. Large-scale instabilities of the Laurentide ice sheet simulated in a fully coupled climage-system model. Geophys. Res. Lett. 29(24), 2216-2219. Carlson, A. E., Jenson, J. W. and Clark, P. U., 2007. Modeling the subglacial hydrology of the James Lobe of the Laurentide Ice Sheet. Quaternary Science Reviews 10.1016/j. quascirev.2007.02.002. Clark, P. U. 1992. Surface form of the southern Laurentide Ice Sheet and its implications to ice-sheet dynamics. Geol. Soc. Am. Bull. 104, 595-605. Clark, P. U. and D. Pollard 1998. Origin of the middle Pleistocene transition by ice sheet erosion of regolith. Paleoceanography 13(1), 1-9. Clark, C. D. and Stokes, C. R., 2001. Extent and basal characteristics of the M’Clintock Channel Ice Stream. Quaternary International 86, 81-101. Crary, A. P. 1960. Arctic ice island and ice shelf studies: Part 2. Arctic 13, 32-50. Dalziel, I. W. D. and D. H. Elliot 1971. Evolution of the Scotia Arc. Nature 233(5317), 246-252. Dansgaard, W., S. J. Johnson, H. B. Clausen, Dahl-Jensen, N. S. Gundestrup, C. U. Hammer, C. S. Hvidberg, J. P. Steffensen, J. Jouzel, and G. Bond 1993. Evidence for general instability of past climate from a 250-kyr ice-core record. Nature, 364(6434), 218-220. Davies-Jones, R. P. 1971. Thermal convecion in a horizonal plane Couette flow. J. Fluid Mech. 49(1), 193-205. Davis, P. T., Briner, J. P., Coulthard, R. D., Finkel, R. W. and Miller, G. H., 2006. Preservation of Arctic landscapes overridden by cold-based ice sheets. Quaternary Research 65, 156-163. De Angelis, H., and P. Skvarca 2003, Glacier surge after ice shelf collapse. Science 299, 1560-1562. De Angelis, H., and J. Kleman 2008. Paleo-ice-stream onsets: examples from the north-eastern Laurentide Ice Sheet. In Earth Surface Processes and Landforms, Wiley-Interscience 33, 560-572. Denton, G. H. and T. J. Hughes 1981a. Eds. The Last Great Ice Sheets. Wiley Interscience, New York, 484 pages. Denton, G. H. and T. J. Hughes 1981b. The Arctic Ice Sheet: An outrageous hypothesis. In G. H. Denton and T. J. Hughes (Eds. ), The Last Great Ice Sheets, Wiley Interscience, New York, 437-467. Denton, G. H. and T. Hughes 2002. Reconstructing the Antarctic ice sheet at the Last Glacial Maximum. Quat. Sci. Rev. 21, 193-202. Denton, G. H., T. J. Hughes, and W. Karlen 1986. Global ice-sheet system interlocked by sea level. Quat. Res. 26, 3-26. Denton, G. H., R. F. Anderson, J. R. Toggweiler, R. L. Edwards, J. M. Schaefer, and A. E. Putnam 2010. The last glacial termination. Science 328, 1652-1656. Dorrer, E., W. Hofman, and W. Seifert 1969. Geodetic results of the Ross Ice Shelf survey expeditions, 1962-63 and 1965-66. J. Glaciol. 8, 67-90. Dove, D., L. Polyak, and B. Coakley 2014. Widespread, multi-source glacial erosion on the Chukchi margin, Arctic Ocean. Quat. Sci. Rev. 92, 112-122. Dowdeswell, J. A. et al., 2010. High-resolution geophysical observations from the Yermak Plateau and norhern Svalbard margin: implications for ice-sheet grounding and deep-keeled icebergs. Quat. Sci. Rev. 29, 3518-3531. Dowdeswell, J. A., M. Canals, M. Jakobsson, B. J. Todd, E. K. Dowdeswell, and K. A. Hogan 2016. The variety and distribution of submarine glacial landforms and implications for ice-sheet reconstructions. Geol. Soc. London, Memoirs 46(1), 519-552. Drewry, D. J. 1978. Aspects of the early evolution of West Antarctic ice. In Zinderen Bakker E. M. van Sr, ed. Antarctic Glacial History and World Palaeoenvironments. Rotterdam, A. A. Balkema, 25-32. Drewry, D. J. 1983. Antarctica: Glaciological and Geophysical Folio, Cambrige, Scott Polar Research Institute, University of Cambridge, UK. Dyke, A. S., 1999. Last Glacial Maximum and deglaciation of Devon Island, arctic Canada: Support for the Innuitian Ice Sheet. Quaternary Science Reviews 18 (3), 393–420. England, J., 1997. The last glaciation of Nares Straight: Ice configuration, deglacial chronology, and regional implications. Paper presented at the 27th Arctic Workshop, Ottawa, Canada. Erlingsson, U., 2008. A Jökulhlaup from a Laurentian Captured Ice Shelf to the Gulf of Mexico Could Have Caused the Bolling Warming. Geografiska Annaler 90A (2), 125-140. Ewing, M. and W. L. Donn 1956. A Theory of Ice Ages. Science 123, 1061-1066. Ewing, M. and W. L. Donn 1957. A Theory of Ice Ages II. Science, 127, 1159-1162. Ewing, M. and W. L. Donn 1959. Discussiion of Ewing Donn Theory of Ice Aes. Science 129, 464-465. Fastook, J. L. and T. J. Hughes 2013. New perspectives on paleoglaciology. Quat. Sci. Rev. 80, 169-194. Flint, R. F., 1971. Glacial and Quaternary Geology. NewYork, John Wiley. Fretwell, P., et al., 2013. Bedmap2: improved ice bed, surface and thickness data sets for Antarctica. The Cryosphere 7.1, http://dx.doi.org/10.5194/tc-7-375-2013. Gallagher, A.P. and A.M. Mercer 1965. On the behaviour of small disturbances on plane Couteet flow with a temperature gradient. Proc. Roy. Soc. Lon., Ser. A, 286(1404), 117-128. Glen, J. 1955. The creep of polycrystalline ice. Proc. R. Soc. A, 228(1175), 519-538. Glen, J. W. 1958, The flow law of ice. Int. Assoc. Sci. Hydrol. 47, 171-183. Gow, A. J. 1970. Preliminary results of studies of ice cores from the 2164 m deep drill hole, Byrd station, Antarctica. International Symposium on Antarctic Glaciological Exploration. Int. Assn. Sci. Hydrol., Report 11, 78-90. Gow, A. J., T. Ueda, D. E. Garfield 1968. Antarctic ice sheet: preliminary results of first corehole to bedrock. Science 161, 1011-1013. Greene, C. A., D. E. Gwyther, D. D. Blankenship 2016. Antarctic Mapping Tools for Matlab. Computers & Geosciences, http://dx.doi.org/10. Grant, D. R. 1977. Altitudinal weathering zones and glacial limits in western Newfoundland with particular interest to Gros Morne National Park. Geological Society of Canada Paper, 77(1A), 455-463. Grosswald, M. G., 1996. Evidence for an ice sheet advance from the Arctic shelf upon the coast of northeastern Siberia. Transactions (Doklady) of the Russian Academy of Sciences 350 (7), 1186-1191. Grosswald, M. G., 1998. Late Weichselian ice sheets in Arctic and Pacific Siberia. Quaternary International 45/46, 3–18. Grosswald, M. G., 1999. Cataclysmic Megafloods in Eurasia and the Polar Ice Sheets (in Russian). Scientific World, Moscow, 117 pages. Grosswald, M. G., and T. Hughes, 1998. Evidence for Quaternary glaciation of the Sea of Okhotsk. International Project on Paleoclimology and Late Cenozoic Climate (IPPCCE) Newsletter, No. 11, 3-25. Grosswald, M. G. and T. Hughes, 1999. The case for an ice shelf in the Pleistocene Arctic Ocean. Polar Geog., 23 (1), 23-54. Grosswald, M. G. and T. J. Hughes, 2002. The Russian component of an Arctic Ice Sheet during the Last Glacial Maximum. Quat. Sci. Rev. 21 (1), 121–146. Grosswald, M. G., and T. J. Hughes, 2004. Comment on “Brigham-Grette et al., (2003). Chlorine-36 and 14C chronology support a limited last glacial maximum across central Chukotka northeastern Siberia and no Beringian ice sheet.” and Gualtieri et al., (2003). Quat. Res., 62, 223-226. Grosswald, M. G., W. Karlén, Z. Shishorina, and A. Bodin, 1992. Glacial landforms and the age of deglaciation in the Tiksi area, East Siberia. Geografiska Annaler 74A (4), 295-304. Grosswald, M. G., T. J. Hughes, and N. P. Lasca 1999. Oriented lake-and-ridge assemblages of the Arctic costal plains: glacial landforms modified by thermokarst and solifluction. Polar Record 35(194), 215-230. Gualtieri, L., S. Vartanyan, J. Brigham-Grette, and P. M. Anderson 2003. Pleistocene raised marine deposits on Wrangel Island, northeasast Siberia and implications for the presence of an East Siberian ice sheet. Quat. Res. 59, 399-410. Halberstadt, A. R. W., L. M. Simkins, S. L. Greenwood, and J. B. Anderson 2016. Past ice-sheet behaviour: retreat scenarios and changing controls in the Ross Sea, Antarctica. The Cryosphere, 10, 1003-1020. Hall, B. L., G. H. Denton, and G. H. Baroni 2004. Holocene relative sea-level history of the southern Victoria Land Coast, Antarctica, Gob. Planet. Chang., 421-263. Hall, B. L., G. H. Denton, J. O. Stone, and H. Conway 2013. History of the grounded ice sheet in the Ross Sea sector of Antarctica during the Last Glacial Maximum and the Last Termination. Geol. Soc. London, Special Pub. vol. 381, http://dx.doi.org/10.144/SP381.5. Hattestrand, C. and A. P. Stroeven 1996. Field evidence for wet-based ice sheet erosion from the south-central Queen Elizabeth Islands, Northwest Territories, Canada. Arctic and Alpine Res. 28, 466-474. Hayes, D. E., and L. A. Frakes 1975. General synthesis, Deep Sea Drilling Project, Leg 28. Deep Sea Drilling Project. Initial Reports 28, 919-942. Hays, J. D., Imbrie, J. and Shackleton, N. J., 1976. Variations in the Earth’s orbit: Pacemaker of the ice ages. Science, 1974, 1121-1132. Heinrich, H. 1988. Origin and consequences of cyclic rafting in the northeast Atlantic Ocean during the past 130,000 years. Quat. Res. 29, 142-152. Hollister, C. D. and 12 others 1976. Site 325. Deep Sea Drilling Project. Initial Reports 35, 157-193. Holdsworth, G., and A. Traetteberg (1974), Deformation of a floating ice island, in Proceedings of the 2nd International Conference on Port and Ocean Engineering Under Arctic Conditions, Reykjavik, Iceland, August 1973, 419-440. Horgan, H. J. and S. Anandakrishnan 2006. Static grounding lines and dynamic ice streams, evidence from the Siple Coast. Geophys. Res. Lett. 33, L18502, doi:10.1029/2006GL027091. Hughes, B. A. and T. J. Hughes, 1994. Transgressions: Rethinking Beringian glaciation. Palaeogeography, Palaeoclimatology, Palaeoecology, 110 (3-4), 275-294. Hughes, T. J. 1970. Convection in the Antarctic ice sheet leading to a surge of the ice sheet and possibly to a new ice age. Science 170(3958) 630-633. Hughes, T. 1973a. Glacial permafrost and Pleistocene ice ages. In Permafrost: The North American Contribution to the Second International Conference, National Academy of Sciences, Washington, D. C, 213-223. Hughes, T. 1973b. Is the West Antarctic Ice Sheet disintegrating? J. Geophys. Res., 78, 7884-7910. Hughes, T. J. 1976. The theory of thermal convection in polar ice shheets. J. Glaciol. 16(74), 41-71. Hughes, T. 1977a. West Antarctic ice streams. Rev. Geophys. and Space Phys., 15(1), 1-46. Hughes, T. J. 1977b. Do oxygen isotope data from deep coreholes reveal dike-sill thermal convection in polar ice sheets? In Isotopes and Impurities in Snow and Ice, Int. Assn. Sci. Hydrol. Pub. 118, 336-340. Hughes, T. J. 1981a. Numerical Reconstructions of Paleo-Ice Sheets. In The Last Great Ice Sheets, Eds., G. H. Denton and T. J. Hughes. Wiley Interscience, New York, 221-261. Hughes, T. 1981b. Lithosphere deformation by continental ice sheets. Proc. R. Soc. Lond. A378, 507-527. Hughes, T. 1981c. The weak underbelly of the West Antarctic iced sheet. J. Glaciol. 27, 518-525. Hughes, T. 1982, On the disintegration of ice shelves: The role of thinning, Annals of Glaciology, 3, 146-151. Hughes, T. 1983, On the disintegration of ice shelves: The role of fracture, J. Glaciol., 29(101), 98-117. Hughes, T. J., 1985. The Great Cenozoic Ice Sheet. Palaeogeography, Palaeoclimatology, Palaeoecology, 50, 9-43. Hughes, T., 1986a. The marine ice transgression hypothesis. Geografiska Annaler, 69A (2), 237-250. Hughes, T., 1986b. The Jakobshavn Effect. Geophys. Res. Lett. 13(1), 46-48. Hughes, T., 1986c. Can ice sheets trigger abrupt climatic chane? Arctic and Alpine Res. 28(4), 448-465. Hughes, T. 1992. On the pulling power of ice streams. J. Glaciol. 38(128), 125-151. Hughes, T. J. 1998. Ice Sheets. Oxford University Press. New York, 343 pages. Hughes, T. 2002. Calving bays. Quat. Sci. Rev. 21(1), 267-282. Hughes, T. 2009. Thermal convection and the origin of ice streams. J. Glaciol., 55(191), 524-536. Hughes, T. J. 2012a. Holistic Ice Sheet Modeling: A First-Order Approach. Earth Sciences in the 21st Century series, Nova Science Publishers, New York 261 pages. Hughes, T. 2012b. Are ice-stream tributaries the surface expression of thermal convection rolls in the Antarctic ice sheet. J. Glaciol., 58(210), 811-814. Hughes, T. J. 2016. Global warming is good. Climate Change 2(7), 130-133. Hughes, T. J., G. H. Denton, and M. G. Grosswald 1977. Was there a Late Wurm Arctic Ice Sheet? Nature, 266, 596-602. Hughes, T. J., G.H . Denton, B. G. Andersen, D. H. Schilling, J. L. Fastook, and C. S. Lingle. 1981. The Last Great Ice Sheets: A Global View. In The Last Great Ice Sheets, Eds. G. H. Denton and T. J. Hughes. Wiley Interscience, 263-317. Hughes, T. J., H. W. Borns, Jr., J. L. Fastook, M. R. Hyland, J. S. Kite, and T. V. Lowell 1985. Models of glacial reconstruction and deglaciation applied to Maritime Canada and New England. Geol. Soc. Am. Special Paper 197, 139-150. Hughes, T., A. Sargent, J. Fastook, K. Purdon, J. Li, J.-B. Yan, and S. Gogineni 2016. Sheet, stream, and shelf flow as progressive ice-bed uncoupling: Byrd Glacier, Antarctica, and Jakobshavn Isbrae, Greenland, The Cryosphere, 10, 193-225, 2016/doi: 0.5194/tc-10-193-2016. Hughes, T., Z. Zhao, R. Hintz, and J. Fastook 2017. Instability of the Antarctic Ross Sea Embayment as climate warms. Reviews of Geophysics, 55, doi:10.1002/2016RG000545. Hulbe, C. L., D. R. MacAyeal, G. H. Denton, J. Kleman, and T. V. Lowell 2004. Catastrophic ice-shelf break-up as the source of Heinrich-event icebergs. Paleoceanography 19, PA1004, doi:10.1029/2003PA000890. Imbrie, J. 1985. A theoretical framework for the Pleistocene ice ages. J. Geol. Soc. London 142, 417-432. Ives, J. D., J. T. Andrews, and R. G. Barry, 1975. Growth and decay of the Laurentide Ice Sheet and comparison with Fenno-Scandinavia. Die Naturwissenschaften, 62, 118-125. Jacobs, S., C. Giulivi, P. Dutrieux, E. Rignot, F. Nitsche, and J. Mouginot (2013), Getz Ice Shelf melting response to changes in ocean forcing, J. Geophys. Res: Oceans, 118, 4152-4168. Jakobsson, M. 1999. First high-resolution chirp sonar profiles from the central Arctic Ocean reveal erosion of Lomonosov Ridge sediments. Marine Geology, 158, 111-123. Jakobsson, M., L. Polyak, M. Edwards, J. Kleman, and B. Coakley 2008. Glacial geomorphology of the central Arctic Ocean: the Chukchi Borderland and the Lomonosov Ridge. Earth Surface Processes and Landforms 33, 526-545. Jakobsson, M., J. Nilsson, M. O’Regan, J. Backman, L. Lowemark, J. A. Dowesewll, L. Mayer. L. Polyak, C. Marcussen, E. Sellen, and A. Wallin 2010. An Arctic Oean ice shelf during MIS 6 constrained by new geophysical and geological data. Quat. Sci. Rev. 29, 3505-3517. Jakobsson, M., J. B. Anderson, F. O. Nitsche, R. Gyllencreutz, A. E. Krishner, N. Kirchner, M. O’Regan, R. Mohammad, and B. Eriksson 2012. Ice sheet retreat dynamics in inferred from glacial morphology of the central Pine Island Bay Trough, West Antarctica. Quat. Sci. Rev. available online. Jakobsson, M., K. Andreassen, R. Bjarnadottir, D. Dove, J. A. Dowdeswell, H. H. England, S. Funder, K. Hogan, O. Inngolfsson, A. Jennings, N. Krog-Larsen, N. Kirchner, J. Y. Landvik, L. Mayer, N. Mikkelsen, P. Moller, F. Niessen, J. Nilsson, M. O’Regan, L. Polyak, and N. N. Petersen 2013. Arctic Ocean glacial history. Quat. Sci. Rev. http://dx.doi.org/10.1016/j.quascirev.2013.07.033. Jakobsson, M., O. Ingolfsson, A. J. Long, and R. F. Spielhagen 2014. The dynamic Arctic. Quat. Sci. Rev. 92, 1-8. Jakobsson, M., J. Nilsson, L. Anderson, J. Backman, G. Bjork, T. M. Cronin, N. Kirchner, A. Koshurnkof, L. Mayer, R. Noormets, M. O’Regan, C. Stranne, R. Ananiev, N. B. Macho, D. Cherniykh, H. Coxall, B. Eriksson, T. Floden, L. Gemery, and O. Gustafsson 2016. Evidence for an ice shelf covering the central Arctic Ocean. Nature Communications 7, doi: 10.1038/ncomms10365. Jakobsson, M., C. Pearce, T. M. Cronin, J. Backman, L. G. Anderson, N. Barrientos, B. Bjork, H. Coxall, A. de Boer, L. A. Mayer, C.-M. Morth, J. Nilsson, J. E. Rattray, C. Stranne, I. Semiletov, and M. O’Regan 2017. Post-glacial flooding of the Bering Land Bridge dated to 11 ka BP based on new geophysical and sediment records. Clim. Past 13, 991-1005. Jenson, J. W., P. U. Clark, D. R. MacAyeal, C. Ho, and J. C. Vela 1996. Numerical modeling of advective transport of saturated deforming sediment beneath the Lake Michigan Lobe, Laurentide Ice Sheet. Geomorphology 14, 157-166. Jeong, S., I. J. Howat, J. N. Bassis 2016. Accelerated ice shelf rifting and retreat at Pine Island Glacier, West Antarctica. Geophys. Res. Lett. 43, doi:10.1002/2016GL071360. Johnson, J. and J. L. Fastook 2002. Northern Hemisphere glaciation and its sensitivity to basal melt water. Quat. Int. 95-96, 65-74. Kamb, B. 2001. Basal zone of the West Antarctic ice streams and its role in lubrication of their rapid motion, in The West Antarctic Ice Sheet: Behavior and Environment, R. B. Alley and R. A. Bindschadler, eds., Antarctic Research Series, American Geophysical Union, Washington, D. C., 157-200. Kaplan, M. R., G. H. Miller, and E. J. Steig, 2001. Low-gradient outlet glaciers (ice streams?) drained the Laurentide ice sheet. Geology 29 (4), 343-346. Kellogg, T. B., 1980. Paleoclimatology and paleo-oceanography of the Norwegian and Greenland Seas: Glacial-interglacial contrasts. Boreas 9, 115-137. Kellogg, T. B., and D. K. Kellogg (1987), Recent glacial history and rapid ice-stream retreat in the Amundsen Sea, J. Geophys. Res., 92(B9), 8859-8864. Kemp, E. M., L. A. Frakes, and D. E. Hayes 1975. Paleo-climatic significance of diachronous biogenic facies, Leg 28, Deep Sea Drilling Project. Deep Sea Drilling Project. Initial Reports 28, 909-917. Kenneally, J. P. and T. J. Hughes 2002 The calving constraints on inception of Quaternary ice sheets. Quat. Int. 95(1), 43-52. Kenneally, J. P., and T. J. Hughes 2004. Basal melting along the floating part of Byrd Glacier. Antarctic Science 16(3), 355-386. Kenneally, J. P., and T. Hughes 2006. Calving giant icebergs: old principles, new applications, Antarctic Science 18(3), 409-419. Kennett, J. P. 1978. Cainozoic evolution of circum-antarctic palaeoceanography. In Zinderen Bakker and E. M. van Sr (eds.) Antarctic Glacial History and Word Palaeoenvironments, A. A. Balkema, Rotterdam, 41-56. Kennett, J. P. and 9 others 1972. Australian-Antarctic continental drift, palaeocirculation changes, and Oligocene deep-sea erosion. Nature Physical Science 239(91), 51-55. Kirchner, N., R. Furer, M. Jakobsson, H. J. Zwally, J. W. Robbins 2013. Statistical medeling of a former Arcic Ocan ice shelf complex using Antarctic analogies. J. Geophys. Res. Earth Surf. 118, 1-13. Kleman, J. 1994. Preservation of landscapes under ice sheets and ice caps. Geomorphology 9, 19-32. Kleman, J. 2008. Where glaciers cut deep. Nature Geosciences 1, 343-344.3013. Kleman, J. and I. Borgstrom 1996. Reconstruction of paleo-ice sheets: The use of geomorphological data. Earth Surface Processes and Landforms 21, 893-909. Kleman, J., C. Hattestrand, I. Borgstrom, and A. P. Stroeven 1997. Fennoscandian paleoglaciology reconstructed using a glacial geological inversion model. J. Glaciol. 43, 283-299. Kleman, J. and C. Hättestrand, 1999. Frozen-bed Fennnoscandian and Laurentide ice sheets during the Last Glacial Maximum. Nature 402, 63-66. Kleman, J. and N. F. Glasser 2007. Subglacial thermal organization (STO) of ice sheets. Quat. Sci. Rev. 26, 585-597. Kleman, J. and P. J. Applegate 2014. Durations and propagation patterns of ice sheet instability events. Quat. Sci. Rev. 92, 32-39. Kleman, J., A. P. Stroeven, and J. Lundqvist 2008. Patterns of Quaternary ice sheet erosion and deposition in Fennoscandia and a theoretical framework for explanation. Science Digest 97, 73-90. Kleman, J., K. Jansson, H. De Angelis, A. P. Stroeven, C. Hattestrand, G. Alm, and N. Glasser 2010. North American Ice Sheet build-up during the last glacial cycle, 115-21 kyr. Quat. Sci. Rev. 29, 2036-2051. Knies, J. and C. Vogt, 2003. Freshwater pulses in the easternn Arctic Ocean during Saalian and Early Weichselian ice-sheet collapse. Quaternary Research 60, 243-251. Krinner, G., J. Mangerud, M. Jakobsson, M. Crucifix, C. Ritz, and J. I. Svendsen, 2004. Enhanced ice sheet growth in Eurasia owing to adjacent ice-dammed lakes. Nature 427 (Letter), 429-432. Kristofferson, Y., Coakley, B., Jokat, W., Edwards, M., Brekke, H. and Gjengedal, J., 2004. Seabed erosion on the Lomonosov Ridge, central Arctic Ocean: A tale of deep draft icebergs in the Eurasia Basin and the influence of Atlantic water inflow on iceberg motion? Paleoceanography 19 (PA3006), doi:10.1029/2003PA000985. Knopoff, L. 1964. The convection current hypothesis. Rev. Geophys. 2(1), 89-112. Landvik, J. Y., S. Bondevik, A. Elverhoi, W. Fjeldskaar, J. Mangerud, O. Salvigsen, M. J. Siegert, J.-I. Svendsen, and T. O. Vorren 1998. The last glacial maximum of Svalbard and the Barents Sea area: Ice sheet extent and configuration. Quat. Sci. Rev. 17, 43-75. Larter, R. D., J. B. Anderson, A. G. C. Graham, K. Gohl, D. Hillenbrand, M. Jakobsson, J. S. Johnsen, G. Kuhn, F. O. Nitsche, J. A. Smith, A. E. Witus, M. J. Bentley, J. A. Dowdeswell, W. Ehrmann, J. P. Klages, J. Lindow, C. O’Cofaigh, and C. Speigel 2014. Reconstruction of changes in the Amundsen Sea and Bellingshausen Sea sector of the West Antarctic Ice Sheet since the Last Glacial Maximum. Quat. Sci. Rev. 100, 55-86. Lindstrom, D. R. and D. R. MacAyeal, 1986. Paleoclimatic constraints on the maintenance of possible ice-shelf cover in the Norwegian and Greenland seas. Paleoceanography 1 (3), 313-337. Lubinski, D. J., L. Polyak, and S. L. Forman 2001. Freshwater and Atlantic water inflows to the deep northern Barents and Kara seas since ca 13 14C ka: foraminifera and stable isotopes. Quat. Sci. Rev. 20, 1851-1879. Lyell, C. 1830. Principles of Geology. John Murray, London. Lythe, M. B., D. G. Vaughan, and the BEDMAP Consortium 2000. BEDMAP-bed topography of the Antarctic. 1:1000,000 scale map. BAS (Misc) 9. Cambridge, British Antarctic Survey. MacAyeal, D. R. 1987. Ice-shelf backpressure: Form drag versus dynamic drag, In Dynamics of the West Antarctic Ice Sheet, edited by C. J. van der Veen and J.
MacAyeal, D. 1989. Large-scale ice flow over a viscous basal sediment: Theory and application to Ice Stream B, Antarctica. J. Geophys. Res., 94(B4), 4071-4087. MacAyeal, D. R. 1992a. Binge/purge oscillations of the Laurentide ice sheet as a cause of the North Atlantic’s Heinrich events. Paleoceanogaphy 8(6), 775-784. MacAyeal, D. R. 1992b. The Basal Stress Distribution of Ice Stream E, Antarctica, Inferred by Control Methods. J. Geophys. Res. 97(B1), 595-603. MacAyeal, D, R., R. A. Bindschadler, and T. A. Scambos 1995. Basal friction of Ice Stream E, West Antarctica, J. Glaciol., 41, 247-262. MacAyeal, D. R., T. A. Scambos, C. Hulbe, M. A. Fahnestock 2003. Catastrophic Ice-Shelf Break-Up by an Ice-Shelf-Fragment-Capsize Mechanism. J. Glaciol. 49(164), 22-36. Mangerud, J., J. I. Svendsen, and V. Astakhov, 1999. The age and extent of the Barents and Kara Sea ice sheets in northern Russia. Boreas, 28, 46-80. Mangerud, J., V. I. Astakhov, M. Jakobsson, and J. I. Svendsen, 2001. Huge Ice-age lakes in Russia. Journal of Quaternary Science 16 (8), 773-777. Marion, G. M. and S. D. Jakubowski 2004. The compressibility of ice to 2.0 kbar. Cold Reg. Sci. Technol. 38(2-3), 211-228. Marcott, S. A., P. U. Clark, L. Padman, G. P. Klinkhammer, S. R. Springer, Z. Liu, B. L. Otto-Bliesner, A. E. Carlson, A. Ungerer J. Padman, F. He, J. Cheng, and A. Schmittner 2011. Ice-shelf collapse from subsurface warming as a trigger for Heinrich events. PNAS 108(33), 13415-13419. Margold, M., C. R. Stokes, and C. D. Clark 2015. Ice streams in the Laurentide Ice sheet: Identification, characteristics, and comparison to moden ice sheets. Earth Sci. Rev. 143, 117-146. Mayewski, P. A. 1975. Glacial geology and late Cenozoic history of the Transantarctic Mountains, Antarctica. The Ohio State University. Institute of Polar Studies. Report 56. Mayewski, P. A., G. H. Denton, and T. J. Hughes 1981. Late Wisconsin Ice Sheets of North Anerica. In G. H. Denton and T. J. Hughes, eds, The Last Great Ice Sheets. Wiley Interscience, New York, 67-178. Mayewski, P. A., L. D. Meeker, M. S. Twickler, S. Whitlow, Q. Yang, and M. Prentice 1997. Major features and forcing of high-latitude Northern Hemisphere atmospheric circulation using a 110,000 year long glaciochemical series. J. Geophys. Res. 102(C12), 26,345-26,266. McKinnon, W. B., F. Nimo, T. Wong, P. M. Schenk, O. L. White J. H. Roberts, J. M. Mooe, J. R. Spencer, A. D. Howard, O. M. Umurhan, S. A. Stern, H. A. Weaver C. B. Olkin, L. A. Young, K. E. Smith, and the New Horizons Geology, Geophysics and Imaging Theme Team 2016. Nature 534, 82-87. Mercer, J. H. 1968. Glacial geology of the Reedy Glacier area, Antarctica, Bull. Geol. Soc. Am., 79, 471-486. Mercer, J. H. 1970. A former ice sheet in the Arctic Ocean. Palaeogeog., Palaeoclim., Palaeoecol. 8, 19-27. Mercer, J. H. 1978. West Antarctic Ice Sheet and CO2 greenhouse effect: a threat of disaster. Nature 271, 321-325. Naslund, J. O., J. L. Fastook, and P. Holmlund 2003. New ways of studying ice sheet flow directions and glacial erosion by ice-sheet modeling: examples from Fennoscandia. Quat. Sci. Rev. 22(2-4), 89-102. Niessen F., J. Matthiessen, J. K. Hong, A. Hegewald, J. Mattheissen, R. Stein, S. Kim, S. Kim, L. Jensen, W. Kokat, S.-I. Nam, S.-H. Kang 2013. Repeated Pleistocene glaciation of the East Siberia continental margin. Nat. Geosci. 6, 842-846. Nilsson, J., M. Jakobsson, C. Borstad, N. Kirchner, G. Bjork, R. T. Pierrehumbert, and C. Stranne 2017. Ice-shelf damming in the glacial Arctic Ocean: dynamical regimes of a basin-covering kilometre-thick icd shelf. The Cryosphere 11, 1745-1765. Nimmo, F. and M. Manga 2002. Causes, characteristics and consequences of convective diaprism on Europa. Geophys. Res. Lett. 29(23). O’Regan, M., J. Backman, N. Barrientos, T. M. Cronin, L. Gemery, N. Kirchner, L. A. Mayer, J. Nilsson, R. Noormets, C. Pearce, I. Semilietov, C. Stranne, and M. Jakobsson 2017. De Long Trough: A newly discovered glacial trough on the West Siberian Continental Margin. Clim. Past Discuss, doi:10.5194cp-2017-56. Pappalardo, R. T., J. W. Head, R. Greeley, R. J. Sullivan, C. Pilcher, G. Schubert, W. B. Moore, M. H. Carr, J. M. Moore, M. J. S. Belton, D. L. Goldsby 1998. Geological evidence for solid state convection in Europa’s ice shell. Nature 391(6665), 365-368. Paterson, W. S. B. 1994. The Physics of Glaciers, Third Edition, Butterworth-Heineman, Oxford, U.K, 481 pages. Peacock, J. D. 1991. Glacial deposits of the Hebridean region. Glacial Deposits in Great Britain and Ireland, ed. J. Ehlers, P. L. Gibbard, and J. Rose, A. A. Balkema, Rotterdam. Peltier, W. R. 1983. Glacial geology and glacial isostasy of the Hudson Bay region. Shorelines and Isostasy, Institute of British Geographers, 285-319. Peltier, W. R. 2004. Global isostasy and the surface of the ice-age earth: the ice-5G (VM2) model and GRACE. Annu. Rev. Earth Planet. Sci. 32, 111-149. Pingree, K., M. Lurie, T. Hughes 2011. Is the East Antarctic ice sheet stable? Quat. Res. 75(3), 417-429. Polyak, L., F. L. Forman, F. H. Herlihy, G. Ivanov, and P. Krinitsky 1997. Late Weichselian deglacial history of the Svyataya (Saint) Anna Trough, northern Kara Sea, Arctic Russia. Marine Geo. 143, 169-188. Polyak, L., M. H. Edwards, B. J. Coakley, and M. Jakobsson, 2001. Ice shelves in the Pleistocene Arctic Ocean inferred from glaciogenic deep-sea bedforms. Nature 410, 453-457. Polyak, L., W. B. Curry, D. A. Darby, J. Bischof, and T. M. Cronin 2004. Contrasting glacial/interglacial regimes in the western Arctic Ocean as exemplified by a sedimentary record from the Mendeleev Ridge. Palaeogeog., Palaeoclim., Palaeoecol. 203, 73-93. Reeh, N., 1984. Reconstruction of the glacial ice covers of Greenland and the Canadian Arctic islands by three-dimensional, perfectly plastic ice-sheet modeling. Annals of Glaciology 5, 115-121. Rignot, E., and S. S. Jacobs 2002. Rapid bottom melting widespread near Antarctic Ice Sheet grounding lines, Science, 296, 2020-2023. Rignot, E., J. Mouginot, and B. Scheuchl 2011. NASA research yields field map of Antarctic ice flow. NASA News, 18 August 2011 http:/www. Rignot, E., J. Mouginot, and B. Scheuchl 2011a. Ice flow of the Antarctic Ice Sheet. Science, 333, 1427, doi:10.1126/science.1208336. Rignot, E., J. Mouginot, B. Scheuchl 2011c. MEaSUREs Antarctic Grounding Line from Differential Satellite Radar Interferometry. Boulder, Colorado USA: National Snow and Ice Data Center. http://dx.doiorg/105067/MEASURES/CRYOSPHERE/nsidc-0498. Rignot, E., J. Mouginot, B. Scheuchl 2011d. Antarctic Grounding Line Mapping from Differential Satellite Radar Interferometry. Geophys. Res. Lett. 38, 10504, doi:10.1029/2011GL047109. Robin, G. deQ. 1955. Ice movement and temperature distribution in glaciers and ice sheets. J. Glaciol. 2(18), 523-532. Paterson, W. S. B. 1994. The Physics of Glaciers. Third Edition, Butterworth-Heineman, Oxford, U.K., 481 pages. Scofield, J. P., J. L. Fastook, and T. J. Hughes (1991), Evidence for a frozen bed, Byrd Glacier, Antarctica. J. Geophys. Res. 96(B7), 11,649-11,655. Shackleton, N. J. and J. P. Kennett 1975. Paleotemperature history of the Cenozoic and the initiation of Antarctic glaciation: oxygen and carbon isotope analyses in DSDP sites 277, 279, and 281. Deep Sea Drilling Project. Initial Reports 29, 743-755. Shaw, J., D. J. W. Piper, G. B. Fader, E. L. King, B. J. Todd, T. Bell, M. J. Batterson, and D. J. E. Liverman, 2006. A conceptual model of the deglaciation of Atlantic Canada. Quaternary Science Reviews, doi:10.1016/j.quascirev.2006.1003.1002. Shepherd, A. , D. Wingham, and E. Rignot 2004. Warm ocean is eroding West Antarctic Ice Sheet. Geophys. Res. Lett. 31, L23402,doi: 10.1039/2004GL021106. Siegert, M. J. 2001. Comments on “Calculating basal thermal zones beneath the Antarctic ice sheet” by Wilch and Hughes, J. Glaciol., 47(156), 159. Siegert, M. J., A. Dowdeswell, J.-I. Svendsen, and A. Elverhoi 2002. The Eurasian Arctic during the last ice age. American Scientist 90, 32-39. Smith, A. G., J. C. Briden, and G. E. Drewry 1973. Phanerozoic world maps. In N. F. Hughes (ed.) Organisms and Continents Through Time Palaeontologial Association, London, Special Papers in Palaeontology 12, 1-42. Stokes, C. R., C. D. Clark, and R. Storrar 2009. Major changes in ice stream dynamics during deglaciation of the north-western margin of the Laurentide Ice Sheet. Quat. Sci. Rev. 28, 721-738. Stokes, C. R., L. Tarasov, and A. S. Dyke 2012. Dynamics of the North American Ice Sheet Complex during its inception and build-up to the Last Glacial Maximum. Quat. Sci. Rev. 50, 86-104. Strutt, J. W. 1916. On convection currents in a horizonal layer of fluid, when the higher temperature is on the underside. Philosophical Magazine, 6th Series 32(192), 529-546. Stuiver, M., G. H. Denton, T. J. Hughes, and J. L. Fastook 1981. History of the Marine Ice Sheet in West Antarctica during the Last Glaciation: A Working Hypothesis. In The Last Great Ice Sheets Eds. G. H. Denton and T. J. Hughes. Wiley Interscience, 319-436. Sugden, D. E. 1977. Reconstruction of the morphology, dynamics, and thermal characteristics of the Laurentide Ice Sheet at its maximum. Arctic and Alpine Res. 9, 21-47. Sugden, D. E. and B. John 1976. Glaciers and Landscapes: A Geomorphological Approach. Edward Arnold, London, 320 pages. Svendsen, J. L., V. I. Astakhov, D. Y. Bolshiyanov, I. Demidov, J. A. Dowdeswell, V. Gataullin, C. Hjort, H. W. Hubberten, J. Mangerud, M. Melles, P. Möller, M. Saarnisto, and M. J. Siegert, 1999. Maximum extent of the Eurasian ice sheets in the Barents and Kara Sea region during the Weichselian. Boreas 28 (1), 234–242. Tarakanov, Y. A., M. G. Grosswald, N. S. Kambarov, and V. A. Prixodko 1987. New evidence for the connection of the Earth’s shape and former glaciation. Doklady Akad. Nauk. SSSR 295(5), 1084-1089. Thomas, R. H. 1971. Flow law for Antarctic ice shelves. Nature Phys. Sci. 232, 85-87. Thomas, R. H. 1973a. The creep of ice shelves: theory, J. Glaciol., 12, 45-53. Thomas, R. H. 1973b. The creep of ice shelves: interpretation of observed behaviour, J. Glaciol., 12, 55-70. Thomas, R. H., 1977. Calving bay dynamics and ice sheet retreat up the St. Lawrence valley system. Géographie Physique et Quaternaire 31 (3-4), 347-356. Thomas, R. H., and C. R. Bentley 1978. A model for Holocene retreat of the West Antarctic Ice Sheet, Quat. Res., 10, 150-170. Thomas, R. H., and D. R. MacAyeal 1982. Derived characteristics of the Ross Ice Shelf, J. Glaciol. 28(100), 397-412. Thomas, R. H., T. J. O. Sanderson, and K. E. Rose 1979. Effect of climatic warming on the West Antarctic ice sheet. Nature 277(5695), 355-358. Toracinta, E. R., R. J. Oglesby, and D. H. Bromwich 2004. Atmospheric response to modified CLIMAP ocean boundary conditions during the Last Glacial Maximum. J. Climate 17, 504-522. Van der Veen, C. J. 1998a. Fracture mechanics approach to penetration of surface crevasses on glaciers. Cold Regions Science and Technology 27, 31-47. Van der Veen, C. J. 1998b. Fracture mechanics approach to penetration of bottom crevasses on glaciers. Cold Regions Science and Technology 27, 213-223. Van der Veen, C. J. 1999. Fundamentals of Glacier Dynamics, Balkema, Rotterdam, 462 pages. Van der Veen, C. J., L. A. Stearns, J. Johnson, and B. Csatho 2014. Flow dynamics of Byrd Glacier, East Antarctica. J. Glaciol. 60(224), doi: 10.3189/2014JoG14J052. Vogt, P. R., K. Crane, E. Sundvor 1994. Deep Pleistocene iceberg plowmarks on the Yermak Plateau: sidescan and 3.5 kHz evidence for thick calving ice fronts and a possible marine ice sheet in the Arctic Ocean. Geology 22, 477-478. Dalziel, I. W. D., and D. H. Elliot 1971. Evoluton of the Scotia Arc. Nature 233(5317), 246-252. Weertman, J. 1957a, On the sliding of glaciers. J. Glaciol. 3(21), 33-38. Weertman, J. 1957b. Deformation of floating ice shelves. J. Glaciol., 3(62), 38-42. Weertman, J. 1974, Stability of the junction of an ice sheet and an ice shelf. J. Glaciol. 13(67), 3-11. Wexler, H. 1961. Growth and thermal structure of the deep ice in Byrd Land, Antarctica. J. Glaciol. 3(30), 1075-1087. Whillans, I. M. 1973. State of equilibrium of the West Antarctic inland ice sheet. Science 182, 476-479. Whillans, I. M., Y. H. Chen, C. J. van der Veen, and T. J. Hughes. 1989. Force Budget III. Application to three-dimensional flow of Byrd Glacier, Antarctica. J. Glaciol. 35(119), 68-80. Whillans, I. M., and C. J. van der Veen 1997. The role of lateral drag in the dynamics of Ice Stream B, Antarctica, J. Glaciol., 43, 231-237. White, W. A. 1972. Deep erosion by continental ice sheets. Geol. Soc. Am. Bull. 83, 1032-1056. Wilch, E., and T. Hughes 2000. Calculating basal thermal zones beneath the Antarctic ice sheet. J. Glaciol., 46(153), 297-310. Winsborrow, M. C. M., K. Andreassen, G. D. Corner, and J. S. Laberg, 2010. Deglaciation of a marine-based ice sheet: Late Weichselian palaeo-ice dynamics and retreat in the southern Barents Sea reconstructed from onshore and offshore glacial morphology. Quaternary Science Reviews 29, 424-442.